The Angolan international basketball player of Benfica de Lisboa, Leandro Conceicao (195-G), arrived in Angola Monday to join the national senior basketball team that from Friday will play the qualifying tourney to the 2019 World Cup, to be held in China. The power forward joined the group under call of Coach Willian Voigt at a time when the Power forward, Edson Ndoniema was forced to leave the works, due to his mother's death, while by injury Jose Antonio and Pedro Bastos. 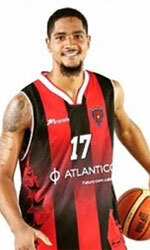 Carlos Morais, Italy's Power Forward, and Yanick Moreira, post of Greece's Paok Salonik, are expected to join Tuesday. As for the national teams, Egypt also arrived on Monday and the others teams, Tunisia, Cameroon, Morocco and Chad are expected to do so on Wednesday. 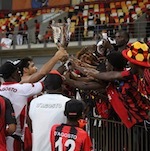 The tournament, whose last qualifying stage runs from November 30 to December 2, will take place in the Kilamba multipurpose arena in Luanda. Angola is second in Group E with 15 points, Cameroon and Egypt have 14, Chad and Morocco 12. Tunisia lead with 18 points and is already qualified to the next world cup.